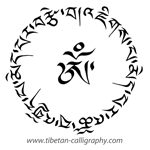 The OM symbol is one of the most powerfull designs in the tibetan culture. As the central point of many tibetan but also other asian mantras. All kind of buddhist sectaries do refer to it. Getting this symbol tattooed may be moved by personal belief – but also by a real attachment to the esthetism of this symbol. The main mantra related to it is the “Om Mani Padme Hum” that it incantated both by clergy and laity of Tibet and all the faithful of the Tibetan Buddhist doctrine. Our recommandation is to get the OM into a circle that will awesome in the back or on shoulder (see example).